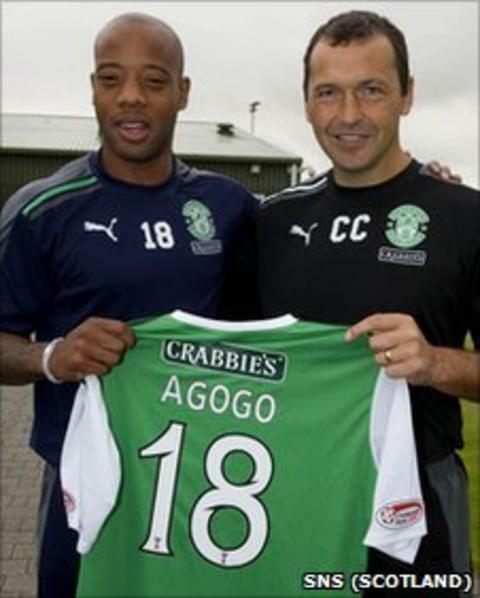 Hibernian have signed Ghana striker Junior Agogo on a one-year contract, subject to international clearance. The 31-year-old has played for several clubs in England and the United States. "I've not played in Scotland before but I'm really looking forward to the challenge ahead," Agogo told Hibs' official website. Manager Colin Calderwood added: "I'm sure the fans will take to him and that his arrival will further strengthen our attacking options." Agogo has been capped 27 times, scoring 12 international goals, and has also played in Egypt and Cyprus. "We are really pleased to be able to add Junior to the squad," said Calderwood. "He is a proven goalscorer and a strong character and he has already settled into Hibernian life in the two weeks he has been on trial with the club. "Junior never gets fazed by challenges and he will add another dimension to our attacking arsenal." Calderwood previously worked with the player at Nottingham Forest. "As soon as Colin told me about the opportunity, there was only one club that I wanted to sign for and that was Hibernian," added Agogo. "I've enjoyed every minute of my time at Hibernian so far and the atmosphere within the squad is both positive and ambitious. "I know what Colin wants from his players and I am aiming to deliver committed displays and goals to the team."